FREETOWN: Four countries including three African Union member states have expressed desires to consolidate diplomatic ties with the Sierra Leone. Kenya, Guinea Bissau, Equatorial Guinea and Russia, made commitments for continuous collaborations on behalf of their governments at the presentation of letters of credence by a High Commissioner, Ambassadors and Plenipotentiaries to President Ernest Bai Koroma at State House, Freetown. The newly accredited, the Kenyan High Commissioner to Sierra Leone, Mr. Francis Kipyegon Sigel praised government for rebuilding the country, through a coordinated national development programme. Mr. Sigel recollected the role played by the Kenyan military contingent deployed with the United Nations mission during the turbulent days of the country from 1999 to 2005. According to High Commissioner Sigel, the occasion symbolically marked the cementing of the existing relations between the two countries which has led to the expansion of friendship and commitments. He highlighted challenges facing Africa, ranging from poverty, illiteracy, gender inequity, development, maternal mortality, sustainability and climate change, which he pledged to do his best to achieve partnership for the development of the two countries. Mr. Sigel called for the establishment of a well structured joint commission for mutual cooperation. President Koroma in response said Kenya and Sierra Leone share a common history based on tradition, colonial experiences, political freedom, memberships of the UN, AU and Commonwealth and that the two countries have complimented efforts of each other. He informed the Kenyan diplomat about government’s efforts in improving the business environment in the country and encouraged all to come and invest in Sierra Leone. “We expect in furthering cooperation in tourism, conservation, trade sector and other areas where Kenya have vast experience”, said President Koroma as he paid gratitude to Kenya for its contributions to Sierra Leone’s peace. 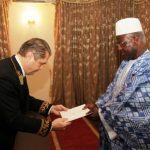 For his part, the Guinea-Bissauan Ambassador to Sierra Leone, Alhaji Brimo Embalo reassured President Koroma of his country’s continuing diplomatic relations and referred to Sierra Leone as a brother’s home and that he is not an outsider in the country. Mr. Embalo registered his commitment toward meeting the well-being of citizenries of sister nations and called on President Koroma to count on him as an active collaborator, determined to strengthen ties between Sierra Leone and Guinea-Bissau. Responding, President Koroma informed the Diplomat that he will be discharging his responsibilities and duties among his brothers and sisters. Government, he reiterated will make available to ambassador Embalo whatever assistance he may require to fulfil his assignments, adding that both countries being members of the AU, UN and ECOWAS share common ideas and aspirations. “We have collaborated with each other to present a common voice on global issues. Our region is faced with many challenges. Together we can tackle the scourge of drug trafficking, the proliferation of small arms and light weapons, trans-border crimes and other challenges that are confronting the West Coast”, declared President Koroma. He expressed satisfaction over the initiatives taken by ECOWAS and the MRU to endorse “our joint capacity in promoting peace and security in our region”. President Koroma explained that Sierra Leone has passed into a law a strong anti-trafficking legislation, reinforcing the anti-drug commission and created a commission on small arms for better coordination of efforts in tackling the threat. He therefore called for effective actions, further cooperation and frequent information sharing between the two countries. 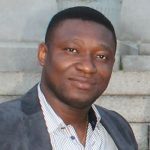 In a related event at State House, similar sentiments were also expressed by ambassadors Alexandra Vadimovich Bregadze of the Russian Federation and Batho-Obam Nsue Mengue of Equatorial Guinea, who also reassured government of their countries’ continuous consolidation of bilateral relations with Sierra Leone. 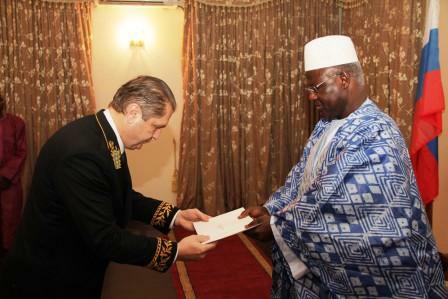 While presenting his credentials to President Koroma, Mr. Bregadez praised government for progress made in the democratic process in which presidential, parliamentary and local government elections have taken place in the country. These elections, he observed have contributed immensely to the development of democratic reforms in Sierra Leone, making it an important state in the world. He acknowledged the high confidence the international community has demonstrated in the government of President Koroma including Russia, noting that his country is fully abreast with the development gains made so far. Ambassador Bregadez called for the establishment of mutual benefits by the two countries, adding that Russia is following the trends in Sierra Leone reformative governance and reaffirmed the resumption of cooperation between the two countries. Batho-Obam Nsue Mengue of Equatorial Guinea in the presenting his credentials also spoke of further strengthening bilateral ties with Sierra Leone on democratic, the economy, social and political fronts, through mutual respect and promotion of projects. President Koroma responded saying the two countries have similar historical attributes in language, culture and economic, adding that the doors of Sierra Leone are always open to Equatorial Guinean investors. “Sierra Leone is the best country to invest in the world”. Meanwhile, the Japanese ambassador to Sierra Leone Mr. Aaoto Nikai is expected to present his credentials and recall letter of his predecessor to President Ernest Bai Koroma, at State House Freetown.